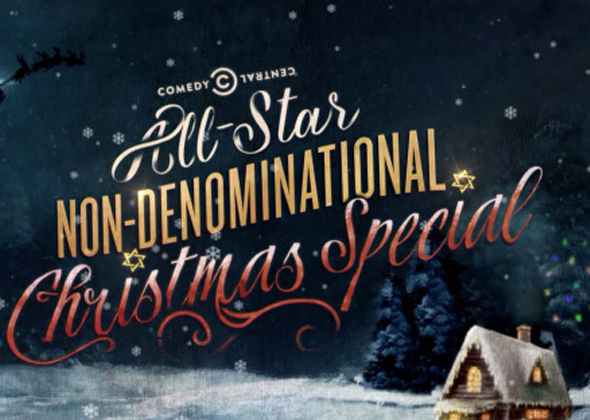 For the first time, Comedy Central presents a one-hour original star-studded holiday event called ""Comedy Central's All-Star Non-Denominational Christmas Special,"" produced by Funny Or Die. Highlights from the special include @midnight: Host Chris Hardwick plays Holiday Hashtag Wars with panelists Steve Agee, Brian Posehn and Aisha Tyler, Key & Peele: Characters Vandaveon and Mike discuss their favorite holiday movies, Kroll Show: Nick Kroll and Jon Daly explain a Canadian Christmas, Nathan For You: Nathan sings a Christmas Carol, RENO 911! : PSA with Lt. Jim Dangle and Deputy Travis Junior who give advice to civilians on how to stay safe during the holidays and more!